REVIEW: If you want a beast of a machine for modelling and rendering, take a look at this. The Boston Venom combines great modelling with exemplary rendering ability and potent storage. The Broadwell generation of microarchitecture finally made it to the mainstream Xeon E5 processor platform at the beginning of the year. 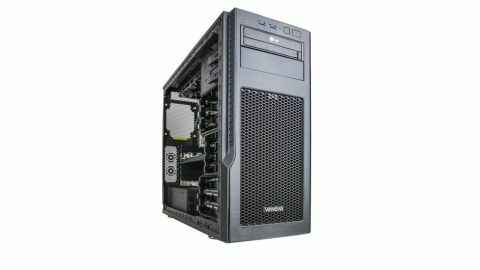 Boasting up to 22 cores per socket, it's been unleashing a huge leap in power ever since – and Boston has taken full advantage with the Venom 2501-0P workstation, offering the full range of options in a dual-socket configuration. Our sample came equipped with a pair of Xeon E5-2690 v4 processors. These provide a good balance between virtual core number (56) and base clock speed, which is a decent 2.6GHz, with a 3.5GHz top Turbo mode for a single core. A CoolIT water cooling system keeps it temperate and quiet. The processors have been partnered with 128GB of 2,400MHz DDR4 SDRAM. This is supplied as eight DIMM modules, leaving no slots free for upgrade. The system supports up to 1TB of memory, so there's plenty of potential headroom, but you would have to swap out memory to upgrade. However, the four modules per processor take full advantage of the Xeon's quad-channel memory architecture for maximum bandwidth, and 128GB will be enough for most near-future applications. Graphics come via the Nvidia Quadro M4000. Aside from its great performance, this card sports four full-sized DisplayPort 1.2 connections, giving a wide range of screen configuration options. Storage comes in the form of a solid state disk, plus a pair of 2TB Hitachi Ultrastar 7K3000 7,200rpm SATA hard disks configured as a RAID 1 mirror for general storage, which will keep your working assets safe. The solid state disk is an ultra-fast Intel SDD 750 Series NVMe unit connected via PCI Express x4. With a healthy 400GB capacity, this is a highly competent storage device that boots up and loads software in a flash. A Blu-ray reader and DVD rewriter rounds off storage, but there's no multi-format memory card reader. Unsurprisingly, the 2501-0P's performance is incredible in every area. In the Maxon Cinebench R15 rendering test, the system achieved a result of 4,376 – one of the highest we have ever seen. Modelling is almost as impressive, with 80.02 in the 3dsmax-05 viewset from SPECviewperf 12.1, and 63.57 in maya-04. Overall, the Boston Venom combines great modelling with exemplary rendering ability and potent storage. It is on the pricey side, but if you want the best of both worlds, it has plenty to offer. This article was originally featured in 3D World issue 215; buy it here.